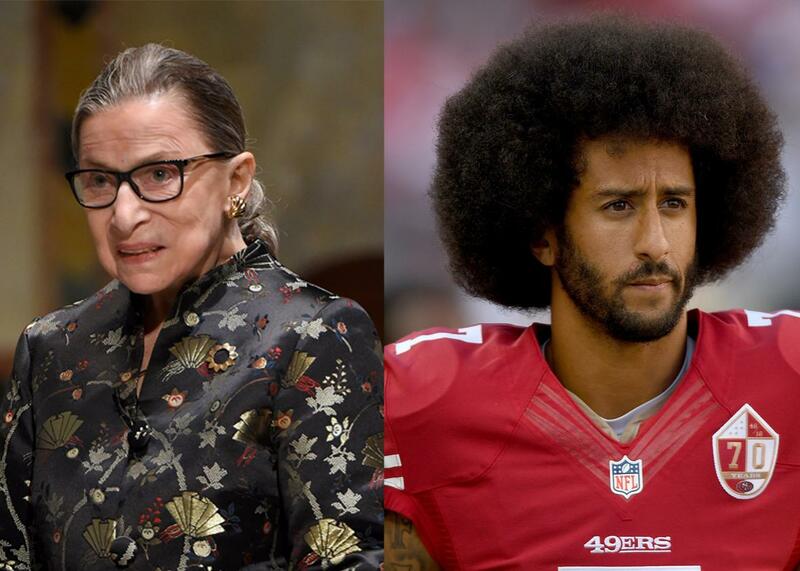 Ruth Bader Ginsburg’s Kaepernick comments end the Notorious RBG myth. Her attacks on Colin Kaepernick dispel that myth once and for all. Ruth Bader Ginsburg and Colin Kaepernick. For Ruth Bader Ginsburg’s many liberal fans, the Supreme Court justice has long been an icon of progressive grit, a happy warrior battling racism, sexism, and homophobia—a reputation that in recent years earned her that famous sobriquet, the Notorious RBG. But Ginsburg’s popular image as a totem of tough, pure progressivism might have just been shattered. Yahoo News’ Katie Couric asked Ginsburg about San Francisco 49ers quarterback Colin Kaepernick—who sparked a broader movement among athletes when he decided to start taking a knee in protest during the national anthem—in an interview released on Monday. The justice answered bluntly: “I think it’s really dumb.” Ginsburg elaborated that she wouldn’t “arrest them for doing it,” but went on to call the protest “disrespectful,” “ridiculous,” “offensive,” and “arrogant.” She also compared the action to burning an American flag. Many of Ginsburg’s biggest fans found her statements deeply disappointing. They are, no doubt, but they’re also fairly predictable. There was always a tension between “the Notorious RBG”—a myth, a meme, a marketing campaign—and Ginsburg herself, a wealthy high-society opera lover whose progressive intellectual ideals are increasingly disconnected from today’s new civil rights movement. On Monday, that tension boiled over into an outright paradox: A (white) liberal icon condescendingly maligned an emerging (black) protester for failing to pay respect to a song that celebrates slavery. But if the RBG legend has been shattered, the justice herself remains consistent as ever. Ginsburg supports minority rights without necessarily supporting the minority activists who work today to make those rights a reality. Her views just don’t fit neatly into this decade’s vision of daring, vociferous progressive activism for racial equality. The character of the Notorious RBG was birthed shortly after the Supreme Court invalidated a critical provision of the Voting Rights Act by a 5-4 vote in Shelby County v. Holder. Writing for the majority, Chief Justice John Roberts stripped the federal government of “preclearance”—its ability to preemptively block states that historically disenfranchised blacks from changing their laws to restrict voting—explaining that “things have changed” in the South since the days of Jim Crow. One liberal captivated by Ginsburg’s dissents was Shana Knizhnik, then a student at NYU Law. Knizhnik decided to turn these quotable retorts into memes, transforming the diminutive, soft-spoken justice into “The Notorious RBG,” an homage to the Notorious B.I.G. Comparing this tiny, white, Jewish justice to a famous, heavy, black ’90s rapper created droll cognitive dissonance, and Ginsburg’s words seemed to carry more appeal when amplified through the Notorious RBG character. Moreover, it was extraordinarily gratifying for liberals to see Ginsburg imply that the Shelby County majority didn’t care about racism—especially after Justice Scalia called the Voting Rights Act a “perpetuation of racial entitlement” at oral arguments. Ginsburg’s dissent perfectly captured this virtuous fury, and feminists searching for catharsis found it in the Notorious RBG. Here was an elderly Jewish woman wielding her power for good, a 5-foot-tall legal powerhouse calling out her male colleagues for their indifference toward women. For young liberal women especially, Ginsburg became a symbol of righteous feminism—and her immense authority and courage seemed best expressed through a ridiculous meme. There was already at this point some tension between Ginsburg the (quiet, courteous) person and Ginsburg the (bold, trenchant) dissenter; the Notorious RBG comically resolved that tension by creating an alter ego who embraced Ginsburg’s fighting spirit. Since Hobby Lobby, the meme has become a truly enduring internet phenomenon, even forming the basis of a delightful biographical celebration of Ginsburg co-authored with Knizhnik by MSNBC’s Irin Carmon. In retrospect, however, the Notorious RBG meme simply wasn’t built to last, for two reasons. First, Ginsburg is not the Supreme Court justice whose ideology most closely aligns with the activist internet community that adulates her. That would be Justice Sonia Sotomayor, who has been the lone dissenter in cases that eased constitutional restrictions on police brutality, unreasonable roadside stops, and unreliable eyewitness testimony. Ginsburg joined the majority in those decisions, and even wrote an opinion last term abridging speedy trial rights. (Sotomayor wrote separately, attempting to temper the decision with a concerned concurrence.) All of these cases raised key issues in the current push for criminal justice reform, and Ginsburg was on the wrong side. Second, and more importantly, Ginsburg is not at all plugged in to the modern racial-equality movement the way Sotomayor obviously is. Ginsburg’s social and professional cohort is largely limited to an elite circle of friends in the arts, the law, and academia. She is not a rabble-rouser and probably does not know any rabble-rousers, Sotomayor excluded. Her burgeoning reputation as a boat-rocker or even an iconoclast is exaggerated. She idolizes an older era of civil rights heroes, who effected change through orderly marches, carefully calculated lobbying, and brilliant legal strategizing. It is difficult to imagine Ginsburg praising the Black Lives Matters movement, with its intentionally disruptive protests and shrewd disregard for the old style of activism—which, despite its many virtues, has not stopped police from killing many innocent black men. Kaepernick supports Black Lives Matter; his protest was inspired by the movement, and his demonstrations have become one of its most potent symbols. Ginsburg is not racist, but she is notably detached from the brewing social unrest over racist police abuse. Her patronizing comments reflect an obvious desire for a more respectful type of protest, and a profound misunderstanding about what Kaepernick hopes to achieve. It is only “dumb” and “arrogant” to protest the national anthem for reasons that are dumb and arrogant. Kaepernick’s reasons are neither: He is refusing to show respect for an anthem whose full lyrics cheer the death of recently freed slaves, and doing so to draw attention to the oppression of black people. His supporters have also used the protest to draw attention to police brutality—an issue Ginsburg discussed empathetically in that Yahoo News interview just before Couric brought up Kaepernick. For Ginsburg to call these protests “arrogance” belies a misapprehension of their basic purpose. Plenty of nonminorities, of course, support Black Lives Matter. But the movement’s white allies have had their own reckoning to deal with, striving to comprehend the brutal power of systemic racism and consider how their own actions might perpetuate it. Ginsburg clearly has not had this same reckoning—or else she would know that calling a black man arrogant for protesting racism legitimizes the very racism he is protesting. Like any admirer of Ginsburg, I’m sad to hear her disdainful attitude toward Kaepernick. But I am not surprised at all, and frankly, I’d like to see “the Notorious RBG” fade away at this point. What would emerge is a justice—admirable but imperfect, like any icon—who argues passionately for minority rights in the abstract without fully understanding how each new generation puts those principles into practice. Ginsburg does not appreciate Kaepernick or Black Lives Matter, but on the bench, she votes more or less in line with the civil rights agenda. RBG may be “Notorious” no longer—but so long as she remains broadly devoted to the cause, she should still be considered a progressive hero, flaws and all.